This is the ancient olive tree of Kavousi village in Crete. Based on analysis, this olive tree is considered to be over 800 years old. This is not unusual for an olive tree. Olive trees are included on Wikipedia’s list of “Long Living Organisms”. For any organism to be considered a “long living organism”, the following statement has to be true about the it: If the species’ mortality rate does not increase after maturity, the species does not age and is considered to be biologically immortal. Olive trees are biologically immortal. Yes, you read it correctly. Olive trees are considered biologically immortal. 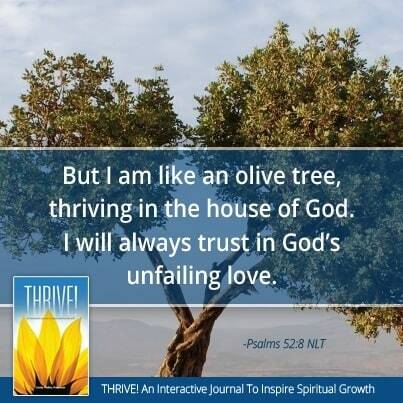 So when David writes in Psalm 52:8, “…I am like an olive tree, thriving in the house of God. I will always trust in God’s unfailing love”, he is saying more than a beautiful phrase. He is saying that I am forever planted in God’s house, trusting in God’s forever, unfailing love. Forever, I am thriving, vibrant, and producing fruit. As I have been meditating on this scripture and the scientific information about olive trees, I am awestruck. I am inspired. I am an olive tree, thriving in the house of God!